Managing a Facebook Page or multiple Facebook Pages can often be a 24/7 commitment, depending on the size of your Page’s audience and their level of engagement with that Page. One way to help lower the amount of time you’re in front of a computer is by posting and interacting with fans from your mobile phone, in this case, the iPhone. The Facebook App for the iPhone was recently updated, making it much easier for a Page administrator to interact with their Facebook audience on the go. To deal with this problem many schedule their Facebook posts when they know they’ll be away from the computer, but there are reasons why you shouldn’t post on Facebook with third party tools. The latest changes to the app, which coincide with the release of the Facebook app for the iPad, give users a much cleaner layout of the Facebook platform, making it both easy and effective for Page administrators to use. When you first open the Facebook app for the iPhone, the new home screen lays out all your options much more concisely, allowing you to browse your News Feed, check your messages, check-in with Facebook Places, view upcoming events and search through your friends list with greater ease than before. 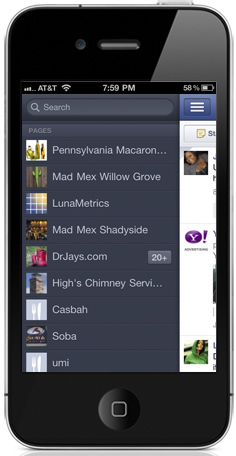 One of the biggest improvements to the new layout of the Facebook for iPhone app is how your Facebook Pages are displayed. Previously, you had to search through all the Pages you like and admin, and then add them as a favorite. By adding them as a favorite you could quickly access them from the homepage of the app. Thankfully the new app eliminates this extra step for Page administrators and simply puts all the Pages you administer in a list on the homepage of the app. This cuts down time, making your social media management efforts that much easier. With this change you can now quickly go down the list and choose which Page you wish to update. You can also see numbers to the right of each Page on your list of Pages, indicating notifications for that particular Page. This change helps Page administrators spend less time roaming their Facebook Page on their iPhone for comments from fans and more time responding to fan feedback because it’s now super easy to see that a notification was triggered. You can still share a photo on your Page, write a post for your Page and respond to a comment on your Page as you did before with the previous version of the Facebook for iPhone application. However, sharing a photo on your Page has slightly changed when it comes to the variety of customization options. After you land on the Facebook Page you wish to update, you’re given two options once you’ve reached the wall tab. You can either write a post or share a photo in terms of updating the Page. Writing a post simply allows you to add text or links to an update on your Facebook wall, while sharing a photo allows you to share a photo of your choosing. 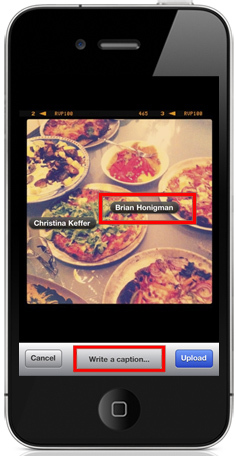 The photo option has become a little more dynamic in terms of allowing you to tag others and write a caption. By clicking on the photo anywhere, then typing in the name of a person, event, group or Page, you’re able to tag them in the photo you’re about to share. The photo you share can come from a photo you’ve just taken or from the photo album on your phone. The ability to add a caption is super easy as well. All you need to do is tap where it says write a caption and begin typing away. From here you can upload your photo to your wall at your leisure. You were always able to change the notification settings of your Facebook for iPhone app, but now they are much clearer and easier to view and change. Applications like Foursquare and Instagram already existed as applications within Facebook, but they’ve been made more accessible from the updated Facebook for iPhone app. 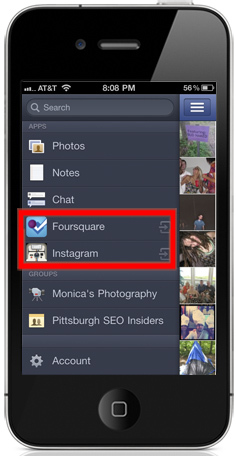 The new layout seamlessly integrates the applications already given access to your Facebook account and installed on your iPhone. This is an interesting move for Facebook in terms of Foursquare and Instagram because Facebook at one time wished to dominate the location based social media vertical and in the case of Instagram, Facebook attempted to buy the company and incorporated its photo filters into Facebook. In both cases, Facebook failed to overtake the market these social platforms specialize in. Maybe this is Facebook’s salute to these platforms for capitalizing on what they do best? The new app also addresses the continuing concerns that Facebook users have regarding privacy. Privacy settings were not very clear within the previous version of the app, but now they are much more concise and easier to customize right from your iPhone. Facebook Places was Facebook’s big push for the last year or so, but recently they handed the torch off to Foursquare and gave up on controlling the location based social media space. 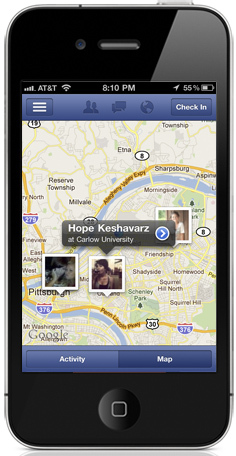 However, this feature shows you where your friends have recently checked in on a nice, Google Maps style map. There’s no doubt in my mind that the Facebook for iPhone app will be upgraded again in the future. Until then, do you find these latest changes helpful for your social media monitoring efforts? 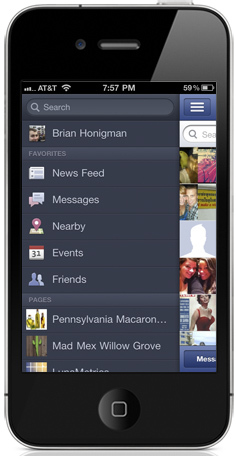 What other changes to the Facebook for iPhone app would you like to see?